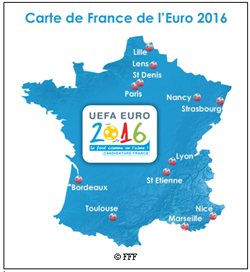 France started preparations for the UEFA 2016 European Football Championship in the host cities of Saint-Denis (near Paris), Paris, Marseille, Lyon, Lille, Bordeaux, Nice, Lens, Nancy, Saint Etienne and Toulouse. 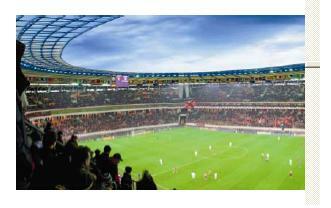 In total € 1,8 billion has to be invested in stadium infrastructure. Seven of the stadiums have to undergo major renovations in order to meet today’s requirements, four new constructions will be built and only one stadium (Saint-Denis) is in perfect shape already. Investors from the (full) public sector will be responsible for three stadiums and private public partnerships are willing to take on another five stadiums. New constructions will be carried out in Lille, Lyon and Bordeaux, that will have completely new football temples, while in Marseille and Saint Etienne existing stadiums will have a thorough renovation. The projects find themselves in various stages. Lille has already begun with the construction; Marseille has just appointed a contractor; In Lyon the tender is to be opened and Bordeaux for example is still designing its plans. France expects that the European Cup will generate an intense and sustainable economic activity for several decades. It has been calculated that 15.000 jobs are to be created for the construction and renovation phase and about 4.500 permanent jobs for maintenance of several locations. Cities and local authorities expect the impact of Euro 2016 in terms of reputation, tourism and of course, the presence of spectators. Every match should attract about 50.000 spectators, resulting in a total of 2,5 million spectators only during the matches. Besides that every match is expected to attract an additional 1,3 million supporters in the ‘zones d’hospitalité’ (villages, squares, etc) in the host cities. The emergence of this new generation of sports facilities has to give a boost to French amateur and professional football as well. 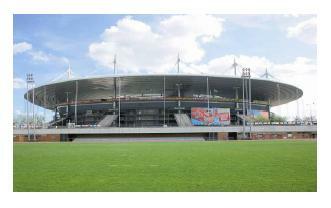 In France there are about 19.000 clubs, with 4 million amateur players and 27.000 referees. Jean-Pierre Escalettes, president of the French Football Federation (FFF), mentioned something similar in an interview in Geneva at UEFA headquarters: “France will be able to upgrade sports facilities and offer the French football a catalyst project for the next ten years while creating a positive and lasting impact on the country”. The hopes are for an increase of the average capacity of the French football stadium, which is confirmed by Frederic Thiriez, president of the Professional Football League: “After 2014, the average capacity of the French stadiums will increase from 27.000 to 35.000 spectators”. In other words: € 183 million of additional revenues for football clubs. TRANSFER supports companies interested in these stadium projects and is planning to organize a trip for subcontractors, suppliers and other parties operating in this sector during the first half of 2012. Would you be interested in participating, please let us know. If you have any queries or suggestions, please do not hesitate to inform us.